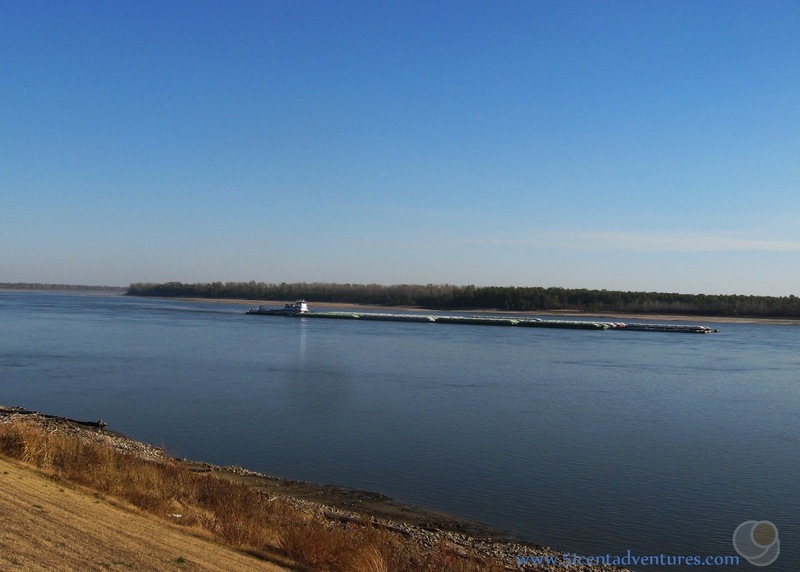 If you look on a map of where the borders of Missouri, Kentucky, and Tennessee meet at the Mississippi River, you will see the river make a sweeping gooseneck curve. A little piece of Kentucky is located inside that curve. 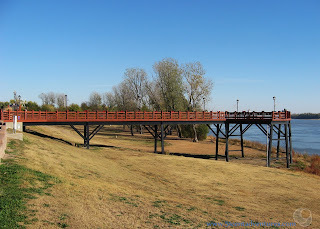 An observation deck in New Madrid, Missouri overlooks the curve, known as the New Madrid Bend. Location: 560 Mott Street New Madrid, Missouri. 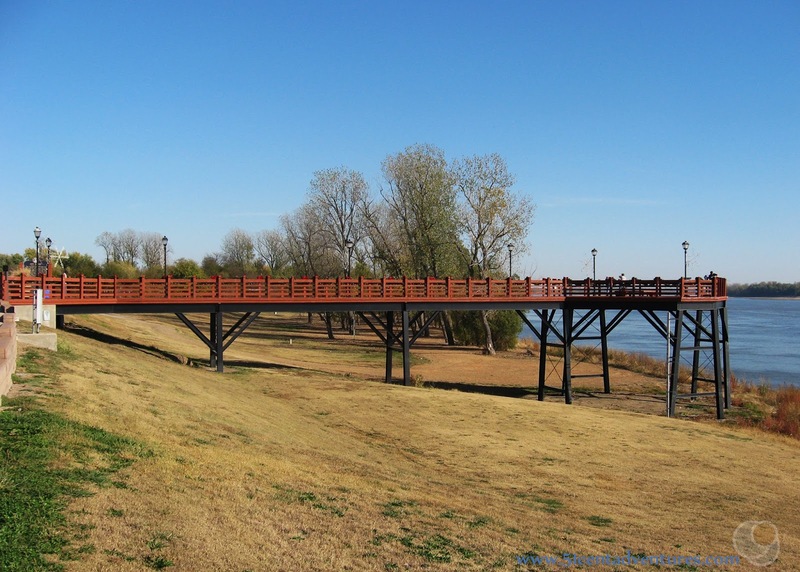 New Madrid is only 5 minutes east of Interstate 55. This was the first stop of note on the first day of our road trip when we moved from Alabama to Utah in November of 2016. We'd left Fort Rucker, Alabama at 1:00 am and driven northwest through parts of Alabama, Mississippi, and Tennessee. 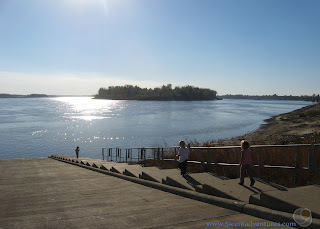 We had crossed the Mississippi River into Arkansas and headed north to Missouri. After over 500 miles of driving we were ready for some sightseeing. 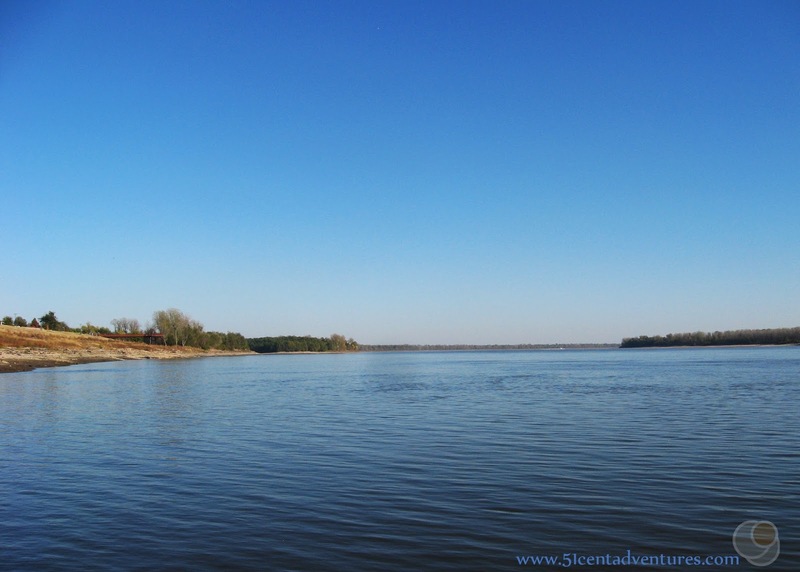 I wanted to see the giant bend in the Mississippi River, known as the New Madrid Bend. This section of the Mississippi River has fascinated ever since I noticed it on the map in our dining room. 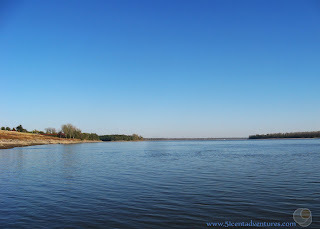 This is a point on the Mississippi River where the borders of Kentucky, Tennessee, and Missouri meet. The river makes a large gooseneck curve at this point. The tiny piece of land inside the curve belongs to Kentucky even though it's not physically attached to the rest of the state. Missouri surrounds it on three sides and Tennessee is on the southern border. I wanted to see it in person. My family had to be more strategic with our sight seeing plans than usual since we were travelling with our 26 foot moving van that was also pulling our jeep on a trailer. I wasn't sure how well the truck and trailer would handle the streets in a small town like New Madrid. So we parked the moving van at a truck stop on the I-55 about 10 miles from town. My husband and daughters left the van and joined me and the other two kids in the Honda. Then we drove into New Madrid. The Observation Deck was easy to find, but I'm glad we had left the moving van. The streets were narrow and parking the van would have been tricky. We parked the Honda near the New Madrid Museum and walked up a hill to the Mississippi Observation Deck. I'm sure that if we were there in the spring the shore of the river would have been under the observation deck. However, we were there in November and the water levels were much lower. Still it was fun to walk out on the deck to get a good view of the mighty river. We also liked looking at the Christmas decorations that were being set up. 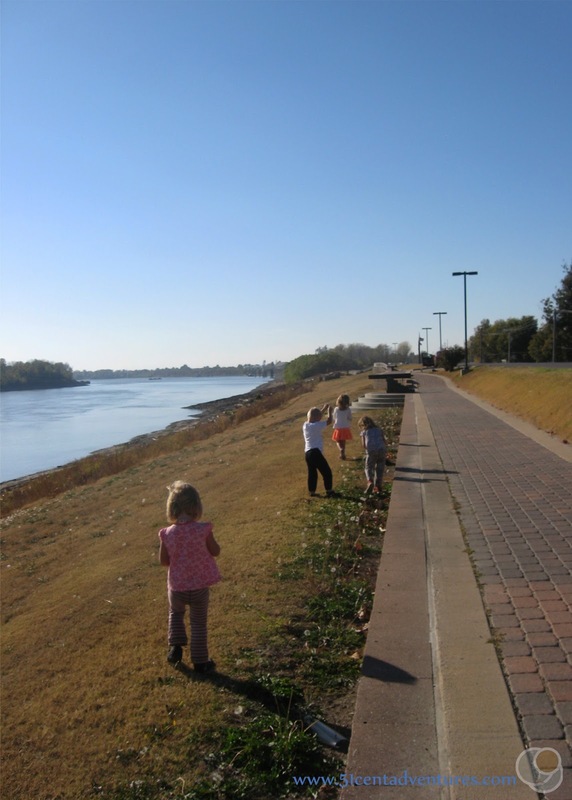 A paved walking trail runs along the bank of the river. This connects the Observation Deck to Riverside Park. Along the way we passed informative signs describing the area's history and replica's of Civil War cannons. This was an important strategic point during the Civil War. My kids were more interested in blowing dandelion seed-tops. In the middle of the water we could see an island. This made me think of the island in the book Tom Sawyer by Mark Twain. 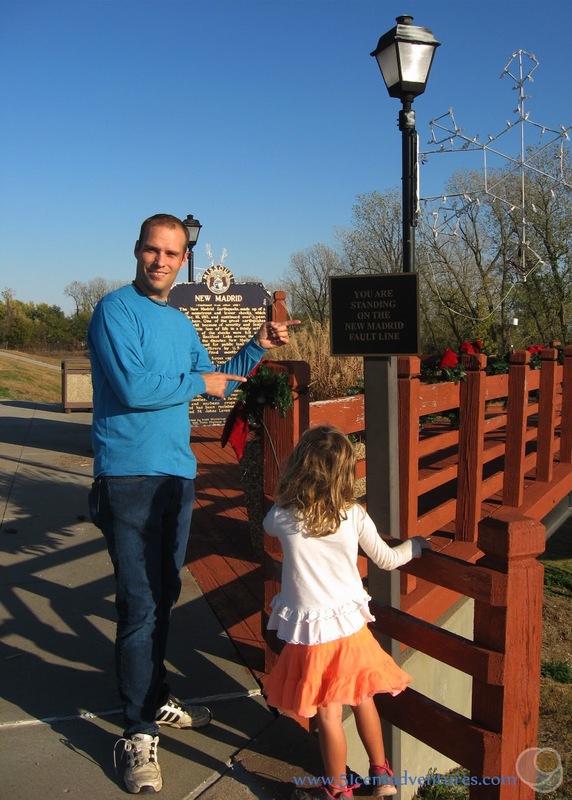 He grew up along the Mississippi River in Hannibal, Missouri which is over 250 miles north of New Madrid. The Riverside Park had a little amphitheater and this cute stone building. The Riverwalk ended at a boat ramp that led down to the water. 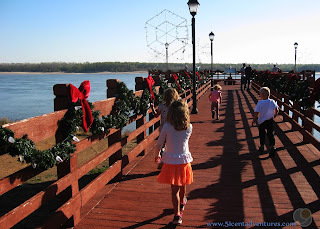 My kids were all eager to throw rocks into the water so we walked down to the river. I really liked the view of the river from down there. I hadn't realized just how big the bend in the river was. As we walked back to the Honda we saw a barge float down the river. It was cool to see it come around the bend and then pass us. I'm sure I'm wrong, but being a captain of a river barge seems like a pretty stress free job. All you have to do is lazily float down a river. 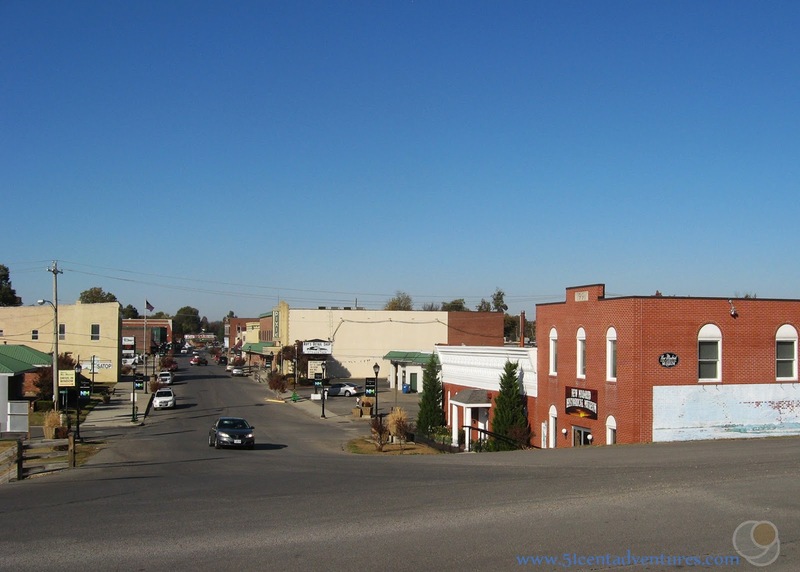 New Madrid is known for more than just a bend in the river. 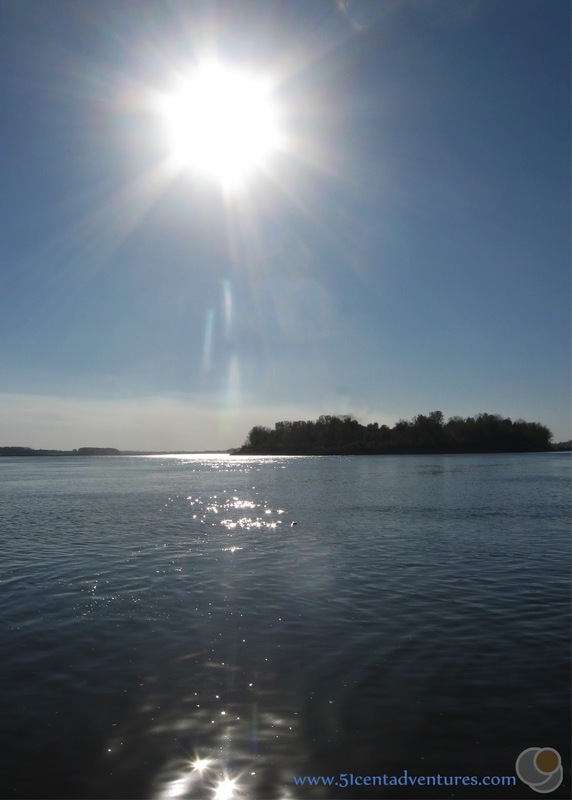 It is also the site of three large earthquakes that occurred in 1811 and 1812. Seismographs didn't exist in North America back then, but based on eye witness accounts these were some of the worst earthquakes to ever happen in the United States. Some experts estimate that if these types of earthquakes were to happen again there would be widespread damage as far away as Boston. (Just a friendly reminder to stock up on food storage.) The fault runs near the Observation Deck. The town itself has some interesting history. 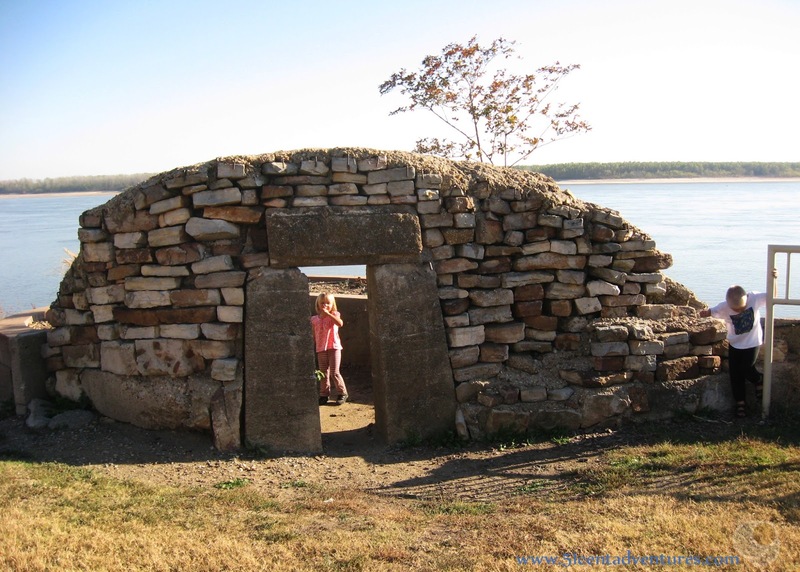 It was established in 1789, and is the oldest American City west of the Mississippi River. 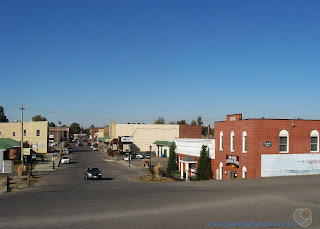 You can learn about the history of the area by visiting the New Madrid Historical Museum which is housed in a building which used to be a saloon. This was a great place to get out and stretch our legs and take a break from all the driving we had done that day. If we'd had more time I would have loved to explore more of the town. But we still had almost 200 miles left to drive before we would stop for the day so it was time to keep going. 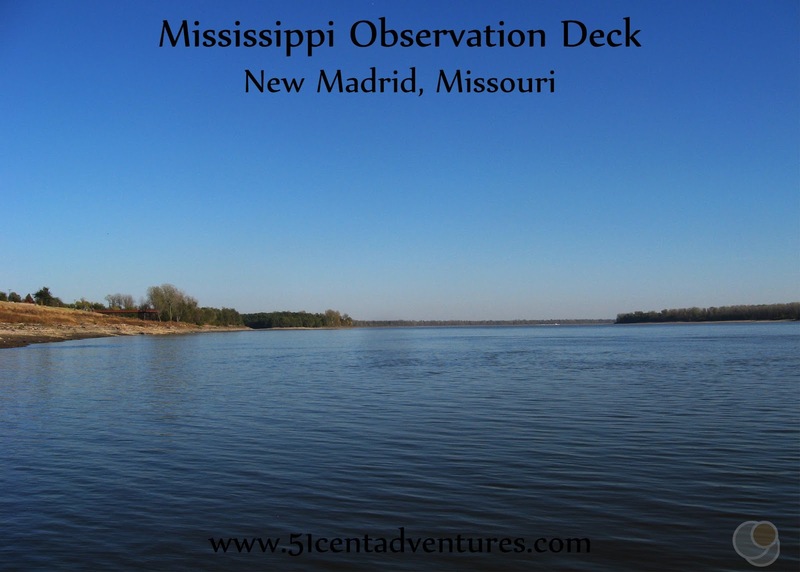 Recommendation: The Mississippi Observation Deck in New Madrid, Missouri is a great place to stop and see the Mississippi River. This area would be especially interesting for Civil War enthusiasts. Directions: New Madrid is located just 3 miles east of I-55. When you reach the town drive along Watts Street until it reaches Main Street. The Observation Deck is located at the southern end of Main Street. Places Nearby: When I originally started planning our route for our move to Utah I wanted to detour through Tennessee and Kentucky before heading west into Missouri. According to that plan we would stop at Mammoth Cave, Kentucky before going to New Madrid. 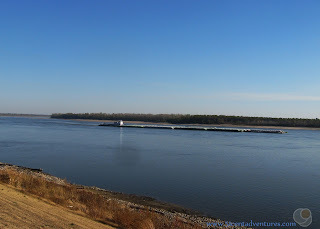 I thought it would be fun to cross the Mississippi River via the Dorena-Hickman Ferry. This is the only ferry between Missouri and Kentucky and one of very few remaining ferries on the Mississippi River. It costs $14 for a single vehicle. Next Stop: Laura Ingalls Wilder Historic Home and Museum in Mansfield, Missouri.